The famous Glasgow club would accumulate many notable achievements over the course of the nineteenth century, from organising the world’s first official international football match in 1872, to transforming the playing style of football and having an instrumental role in the creation of the Scottish FA. 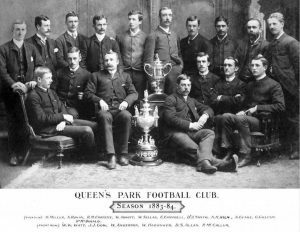 However, in a playing sense the Queen’s Park team of season 1883-84 (competing in an era when football had become established as the national game on either side of the border) can be considered to be the club’s greatest ever side and Scotland’s greatest club side of the period. The team of season 1883-84 had a perfect blend of experience in the form of veteran Charles Campbell (eight times a Scottish Cup winner over a remarkable 16-year career), emerging talents like Walter Arnott (capped 10 times for Scotland against England between 1884 and 1893) and outstanding all-round athletes like Dr John Smith (a Corinthian who scored a hat-trick in Scotland’s 6-1 victory over England in 1881). In season 1883-84 Queen’s Park claimed two of Scotland’s most prized trophies, the Scottish Cup and the Glasgow Charity Cup. The club would also contest the final of the FA Cup, facing Blackburn Rovers at Kennington Oval. The ‘Spiders’ lost the match in highly controversial circumstances, caused by eccentric refereeing, in what was the only disappointment of an otherwise unforgettable season.